Margaret Jean Sparks Manley, 89, loving wife, mother, and grandmother went home to be with her Lord on March 3, 2018, after an extended illness, at Green Valley Nursing Home. Jean was born on March 23, 1928, at the General Hospital in Enid, OK, to Margaret Elizabeth Clark Sparks and Charles E. (Jard) Sparks, of Covington, OK. Jean attended Covington Public Schools until her dad became employed by Knorr Mercantile in Wichita, KS. Jean attended Wichita Public Schools and was baptized at the Fairview Christian Church in Wichita, KS. In 1941, they moved to the family farm in Billings, OK. Jean graduated from Billings High School in 1946. She then moved to Enid and was employed as a telephone operator for Southwestern Bell. In May of 1948, Jean went to inquire about her friend, Ed Manley, who was serving a tour of duty with the United States Army. She was really surprised when Ed was at his family’s home. Jean and Ed became engaged in September of 1948 when Jean went to visit Ed in the oil field of Wyoming. They were married December 5, 1948, in Worland, Wyoming. Jean continued working as a telephone operator in Worland. In May of 1949, they returned to Oklahoma and established their first home west of Billings. They then moved east of Marland and began farming. Both of their daughters were born there. In 1968, they purchased another farm east of Billings, where they lived until they retired in 2011, and moved to Perry. Jean enjoyed working alongside Ed farming, raising Polled Hereford cattle, running Manley Dozer Service, and pumping oil wells. Jean also had many talents of her own such as driving school buses, working in the kitchen at the Billings Fairchild Center, and keeping up with her family and household. 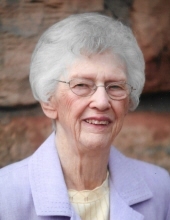 Jean was an active member of the Billings Christian Church and Town and Country OHCE Club. Jean was a very talented seamstress and taught both of her daughters and granddaughters to sew. She loved to help 4-H members with their sewing projects. She was an excellent cook and numerous times delivered home-cooked, full course meals to Ed and the crew in the field. Her life was complete, happy, and fulfilled with years of being a wife, mother, grandmother, and great grandmother. She married her true love, raised a beautiful family, and lived a full and spiritual life. Jean is survived by her daughters: Barbara Pemberton and her husband, Donal, of Billings, OK, Donna Parrish and her husband, Randy, of Perry, OK; four grandchildren: Leslie Box of Perry, OK, Jay Pemberton and his wife, Amy, of Buffalo, OK, Darin Pemberton and his wife, Karma, of Billings, OK, and Beth Mann and her husband, Jared of Moore, OK. She is also survived by five great-grandchildren: Maston Box, Randi Box, Daygen Pemberton, Everett Mann, Evelyn Mann, and Kase Pemberton. One brother, Jerry Sparks of Billings, OK, brother-in-law, Brice Manley, of Duncan, OK, and sister-in-law, Lela Ann Freiling and her husband, Kenneth, of Devol, OK, and numerous nieces and nephews. She was preceded in death by her husband, Ed, her parents, sister-in-law, Karen Sparks, and nephew, Mark Manley. To send flowers or a remembrance gift to the family of Margaret Jean Manley, please visit our Tribute Store. The family would like to greet friends from 6:00 p.m. till 8:00 p.m.
"Email Address" would like to share the life celebration of Margaret Jean Manley. Click on the "link" to go to share a favorite memory or leave a condolence message for the family.